John Allen Amos Jr. (born December 27, 1939) is an American actor known for his roles as James Evans, Sr. on the CBS television series Good Times and in the 1977 miniseries, Roots, for which he received an Emmy nomination. Amos' other television work includes roles in The Mary Tyler Moore Show and a recurring role as Admiral Percy Fitzwallace on The West Wing. In the 1988 Eddie Murphy film, Coming to America, Amos played Cleo McDowell, the father of Shari Headley's lead character, Lisa McDowell. Amos has appeared on Broadway and in numerous films throughout a career that spans four decades. He has received nominations for a Primetime Emmy Award and NAACP Image Award. Amos at "Their Voices, Their Stories African-American Veterans Who Served on Iwo Jima", March 2011. "The Funny Side" "Love American Style" "Maude" "Good Times" "Mary Tyler Moore" "The Love Boat" "The A-Team" "Trapper John, M.D." "Hardcastle and McCormick" "Hunter" "Murder, She Wrote" "The Cosby Show" "Touched by an Angel" "The Fresh Prince of Bel-Air" "Walker, Texas Ranger" “Men in Trees"The West Wing" "Two and a Half Men" "The Ranch" "Roots"
On Good Times (1974), L–R: Ralph Carter, BernNadette Stanis, Jimmie Walker, Esther Rolle, and John Amos. John A. Amos, Jr. was born in Newark, New Jersey, the son of Annabelle and John A. Amos, Sr., who was an auto mechanic. He grew up in East Orange, New Jersey, and graduated from East Orange High School in 1958. He enrolled at Long Beach City College and graduated from Colorado State University qualifying as a social worker with a degree in sociology. Amos also played on the Colorado State Rams football team. Following college, he was a Golden Gloves boxing champion. In 1964, Amos signed a free agent contract with the American Football League's Denver Broncos. Unable to run the 40-yard dash because of a pulled hamstring, he was released on the second day of training camp. He then played with the Cleveland Bulldogs and Joliet Explorers of the United Football League. In 1965, he played with the Norfolk Neptunes and Wheeling Ironmen of the Continental Football League. In 1966, he played with the Jersey City Jets and Waterbury Orbits of the Atlantic Coast Football League. In 1967, he had signed a free agent contract with the American Football League's Kansas City Chiefs. Coach Hank Stram told Amos "you're not a football player, you're a man who is trying to play football." Amos approached Stram with a poem he wrote about the mythical creature that passed the door of all players who are cut from the team. He read it to the team and received a standing ovation from all the players and coaches. Amos said Stram pushed him in the direction of writing after he was released from training camp. He returned to the Continental League where he played that year with the Victoria Steelers. Amos became well known in his first major TV role, playing character Gordy Howard (the weatherman on The Mary Tyler Moore Show) from 1970 until 1973. In 1971, he appeared with a young Anson Williams in a commercial for McDonald's. But he is best known for his portrayal of James Evans, Sr., the husband of Florida Evans, first appearing three times on the sitcom Maude before continuing the role in 61 episodes of Good Times from 1974 to 1976. While playing a hard-working middle-aged father of three on the show, in real life Amos was only 34 when the show began, only eight years older than the actor who played his oldest son (Jimmie Walker) and 19 years younger than his screen wife (Esther Rolle). Amos, much like series co-star Rolle, wanted to portray a positive image of an African-American family, struggling against the odds in the ghetto of Chicago, but saw the premise slighted by lower comedy, and expressed dissatisfaction. Amos was fired from the show after the third season ended because he had issues with Norman Lear and the writers of the show in regards to Jimmie Walker's character J.J. His character James Evans died in a car accident in the first episode of the fourth season, and the series continued for three more seasons without him. Norman Lear said Amos had become a disruption and Amos agrees, saying he wasn't very diplomatic about the direction of the show. Amos disagreed about the writers emphasizing J.J.'s stereotypical buffoonishness including his catchphrases, funny walk and "pigeon hats", fearing it was turning the program into a weekly minstrel show. His character's other son, Michael, wanted to be a Supreme Court Justice and his daughter Thelma wanted to be a surgeon. Amos could see the comedy that could be generated from that but the writers wanted to stay with the J.J. antics. In 1977, Amos appeared in the central role of the adult Kunta Kinte in the ground-breaking television miniseries Roots, based on Alex Haley's book of the same name. Amos was nominated for an Emmy for his performance. In 1980, he starred in the TV film Alcatraz: The Whole Shocking Story. Amos played an Archie Bunker-style character for the 1994 sitcom 704 Hauser which was a modern spin-off of All In The Family, but this series was cancelled after only five episodes (in the series he played a different character than he played in the All in the Family spin-off Maude). He also portrayed Captain Dolan on the television show Hunter from 1984 to 1985. He co-starred in the CBS police drama The District. Amos was a frequent guest on The West Wing, portraying Admiral Percy Fitzwallace, who serves as Chairman of the Joint Chiefs of Staff for most of the show. He played Buzz Washington in the ABC series, Men in Trees. Amos co-starred with Anthony Anderson in the short-lived TV series All About the Andersons in 2003. In 2010, Amos also appeared as recurring character, Ed, on Two and a Half Men, and in 2016 as another recurring character, also (coincidentally) named Ed on the Netflix sitcom The Ranch. He has guest-starred in a number of other television shows including Police Story, The A-Team, The Cosby Show, The Fresh Prince of Bel-Air, In the House, Martin as Sgt. Hamilton Strawn (Tommy's father), Touched by an Angel, Psych, Sanford And Son, My Name Is Earl, Lie to Me, and Murder, She Wrote. He has also appeared as a spokesman for The Cochran Firm (a national personal injury law firm). Amos is the writer and producer of Halley's Comet, a critically acclaimed one-man play that he performs around the world. Amos performed in August Wilson's Gem of the Ocean on Broadway and then later at the McCarther Theatre in Princeton, NJ. Amos was featured in Disney's The World's Greatest Athlete (1973) with Tim Conway and Jan-Michael Vincent, and also starred as Kansas City Mack in Let's Do It Again (1975) with Bill Cosby and Sidney Poitier. His other film appearances have included Vanishing Point (1971), The President's Plane Is Missing (1973), Touched by Love (1980), The Beastmaster (1982), Dance of the Dwarfs (1983), American Flyers (1985), Coming to America (1988), Lock Up (1989), Two Evil Eyes (1989), Die Hard 2 (1990), and Ricochet (1991). He appeared in the 1995 film For Better or Worse and played a police officer in The Players Club (1998). He played Uncle Virgil in My Baby's Daddy (2004), and starred as Jud in Dr. Dolittle 3 (2006). In 2012, Amos had a role in the movie Madea's Witness Protection, as Jake's father. He also appeared in Ice Cube's and Dr. Dre's video for Natural Born Killaz in 1994. In 2009, he released an album of original country music songs. Amos has won more TV Land Awards than anyone else, taking home trophies for his roles on The Mary Tyler Moore Show, Good Times and the TV miniseries Roots. Amos is a veteran of the 50th Armored Division of the New Jersey National Guard and Honorary Master Chief of the United States Coast Guard. Amos has been married three times. Amos's first marriage, between 1965 and 1975, was with artist and equestrian Noel Mickelson, with whom he has two children: Shannon Amos, a successful writer/producer and founder of Afterglow Multimedia, LLC, and Grammy nominated director K.C. Amos. His second marriage was to actress Lillian Lehman from 1978–79. Since 1982, Amos has been married to Elisabete De Sousa. Amos has been a resident of Tewksbury Township, New Jersey. 1973 Sanford And Son Luther in episode "A Visit from Lena Horne "
1984 The A-Team Reverend Taylor in episode "Pure-Dee Poison"
1990 Two Evil Eyes Det. Legrand Segment: "The Black Cat"
^ "Past Commencement Speakers & Honorary Degree Recipients". Drew University. Retrieved September 10, 2017. ^ "John Amos Biography (1939?-)". Filmreference.com. Retrieved 2017-03-20. ^ Patrick Lombardi. "Black History NJ: John Amos - Best of NJ: NJ Lifestyle Guides, Features, Events, and More". Best of NJ. Retrieved 2017-03-20. ^ a b "John Amos Biography". Yahoo! Movies. Retrieved December 8, 2010. 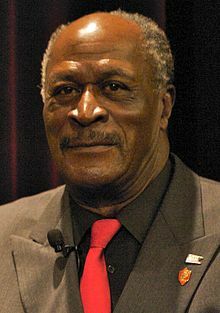 ^ "John Amos: Biography". TV Guide. Retrieved December 8, 2010. ^ Creative Network Studios (June 6, 2014). "John Amos Cochran Firm 1" – via YouTube. ^ Becker, Ellen (February 14, 2013). "John Amos performs "Halley's Comet"". digitalBURG. Archived from the original on January 16, 2017. Retrieved March 20, 2017. ^ "John Amos to debut country single". UPI.com. 2009-06-14. Retrieved 2017-03-20. ^ "Local news". WKRN.com. Retrieved 2017-03-20. ^ "John Amos biodata". American Entertainment International Speakers Bureau, Inc. September 11, 2009. Archived from the original on August 26, 2009. Retrieved September 12, 2009. ^ "Jersey's John Amos stars as sitcom dad". Pqasb.pqarchiver.com. 2003-09-13. Retrieved 2017-03-20.